Due to popular demand, in 2016 we returned to the beautiful surroundings of the Belfast Ulster Hall, for yet another large scale evening of festive entertainment! Our annual summer concert moves into its fifth year with 'The Sound of Musicals'. Our talented members and live musicians, continue to be a winning combination at the start of each summer, with something on the programme for all tastes! Our largest Christmas production to date, staged in the magnificent Ulster Hall, Belfast. A special evening of musical theatre from some of Northern Ireland's finest young talent at Belvoir Players Studio Theatre, July 2015. Due to popular demand, our second full scale Christmas concert, this time in the unique surroundings of the Ulster Folk and Transport Museum, 2014. Our third summer fundraising concert, this time in July 2014 at the Belvoir Players Studio Theatre, Belfast. 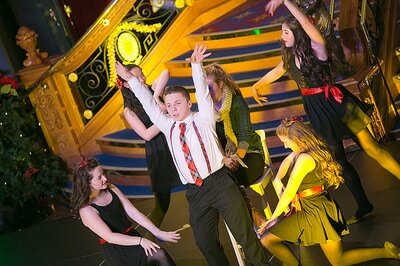 Our first full scale Christmas concert in the fabulous surroundings of the 'Titanic Suite' at Titanic Belfast, 2013. ​Click the picture to read more. Our very first public concert was in aid of our summer projects and chosen charity, 'WaterAid' at The Blackbox Theatre in Belfast. The programme featured the 'Trinity Theatre Arts Dance Group' and members of our company who sang songs from various hit Broadway and West End musicals. A very successful evening raised money for a hand pump to be installed in Nepal and tools to dig a well in Ghana, as well as our own project 'High School Musical 2'. Saturday, July 28th 2012, saw Ravara Productions perform to a full house at Willowfield Parish Church, East Belfast. Soloists and Core Dancers, backed by our 20-strong ensemble and 5 piece band, presented an evening of musical treats from a number of West End and Broadway hit musicals. All money raised went to the Willowfield Church Development Fund, as well as our own summer youth project, 'Grease' 2012.